Following this week’s visit to China by a Russian delegation, several dozen economic agreements were signed between the two nations. Though the headlines were dominated by a huge contract signed between Beijing and Russian gas giant Gazprom, the visit also yielded plans to create a competitor to Boeing and Airbus, as well as agreement on energy supplies. The visit to China this week by a Russian delegation has proved a huge success, leading to several dozen economic agreements being signed. The headlines were dominated by a huge contract agreed by Beijing and Russian gas giant Gazprom, but the talks also yielded plans to create a competitor to Boeing and Airbus, the construction of the first major bridge, and achieving record energy supplies. But it was the monster deal with Gazprom that made the biggest headlines. During the visit of the Russian delegation to Shanghai, on Wednesday, May 21, Gazprom and CNPC signed a 30-year agreement worth $400 billion for the purchase and sale of natural gas. Deliveries are to begin in 2018, and will see 38 billion cubic meters per year shipped to China at $350 per 1,000 cubic meters. "This is Gazprom's biggest contract. A contract like this has never been signed with any company," said the Russian gas giant's chief executive, Alexei Miller, according to Interfax. The agreement making the biggest waves after the Gazprom deal is the joint project between Russia and China on the establishment of a joint long-haul aircraft, which in the future will be a competitor to Boeing and Airbus. According to the participants in the negotiations, the project will require a $10 billion investment, but it is still in the early stages of development. Preliminary baseline data for the project will be presented at the economics ministries of both countries in the summer of 2014. The project is expected to develop into a joint venture, in which the share of the rights will be distributed equally between Russia and China. Russia has already gained experience in international collaboration on the creation of new passenger aircraft: Its Sukhoi SuperJet 100, is being produced as a Russo-Italian joint venture with the participation of Italy’s Finmeccanica corporate group. Another joint project involves the launch of a plant on Russian soil. In 2017, a Chinese manufacturer of off-road vehicles, Great Wall Motors, will launch a plant in the European part of Russia, in the Tula Region. Investment in the project will amount to 18 billion rubles ($522 million) per year, and the company will be able to produce up to 150,000 Haval brand vehicles. Moreover, the new plant will create up to 2,500 jobs. Another initiative in the pipeline concerns the construction of a rubber factory in China. The Russian petrochemical company SIBUR and the Chinese oil company Sinopec will open a rubber production plant in Shanghai, with a production capacity of 50,000 tons per year. The largest share of the project will be owned by Sinopec (74.9 percent), while Sibur will have a 25.1 percent stake. Under the joint venture, the Russian company will primarily provide technology. In 2013, the partners opened a joint venture in Krasnoyarsk for the production of rubber in Siberia: Sinopec’s stake in this project is 25 percent plus one equity share. At the moment, the rubber produced by the plant is supplied to the Chinese market. Despite broadening bilateral cooperation in various sectors, Russia’s principal export to China will continue to be energy, principally oil and gas. Beijing is already the largest buyer of Russian oil: From 2009 to 2038, Rosneft, the world's largest public oil company, will deliver about 665 million tons of oil to China. 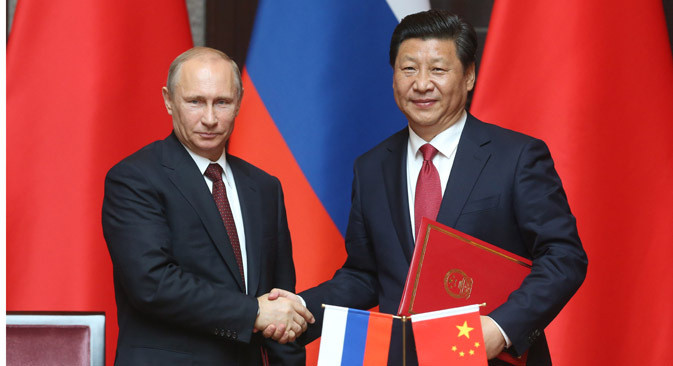 Besides the blockbuster deal with Gazprom, Russia will also supply China with liquefied gas. Yamal LNG has signed an agreement with CNPC to supply 3 million tons of LNG annually. This project involves the construction of the north Russian LNG plant, with a production capacity of 16.5 million tons, and the development of the South Tambeiskoye field. As a base, Gazprom plans to focus on the prices at which LNG is supplied via the Sakhalin-2 development in the Russian Far East to Japan. Last year the price of LNG to Japan accounted for about $512 per 1,000 cubic meters of gas. Moreover, Gazprom has offered Chinese companies a stake in another similar Russian project, Vladivostok LNG, and contracts for the purchase of liquefied natural gas. As Russian Prime Minister Dmitry Medvedev stated in an interview on Bloomberg TV, Chinese investors may also participate in the privatization of state-run Rosneft. However, the size of the package, which may be purchased, has yet to be disclosed. Chinese investors are already included in the capital of Rosneft in 2006, when CNPC bought a 0.6 percent stake in the Russian company during the initial public offering. One of the main areas of cooperation with China will be to attract Chinese companies to implement infrastructure projects. During 2013, the year-on-year volume of traffic through border crossings between Russia and China increased by 8 percent, totaling 30.5 million tons. In the coming months, construction will begin on the first bridge across the Amur River between Russia and China in Siberia. This will be the first link of its kind between Russia and China: There are currently no bridges between the two countries, neither by road, nor rail. According to the Russian side, the new bridge will allow the transport of 21 million tons of cargo annually and will also shorten the transportation distance by 700 kilometers. In turn, the Russian monopoly on the rail market, Russian Railways, and the Chinese state railway operator, China Railway Corporation, have agreed on the construction of logistics centers, the development of passenger traffic, and the reduction of tariffs. China will also help Russia reduce dependence on the dollar in payments: The countries plan to increase payments in their national currencies as per the agreement signed by Russian VTB Bank and Chinese banking corporation Bank of China. Currently, Chinese bankers have issued Rosneft loans in rubles, reducing the dependence of the Russian economy on foreign exchange rates. According to the estimate of Russian President Vladimir Putin, the total volume of joint Russian-Chinese projects in priority areas is about $40 billion. However, the country plans to increase this figure to $200 billion by 2020.